The Qing dynasty (1644-1911), also called the Manchu dynasty, was the last imperial dynasty of China. In 1644, the Chinese capital at Beijing was captured by rebels, upon which the last Ming emperor committed suicide. The Ming dynasty officials and generals called on the Manchus for aid. The Manchus took advantage of the opportunity to seize the capital and establish their own dynasty in China. By adopting the Ming form of government and continuing to employ Ming officials (the in-game Celestial Empire government), the Manchus managed to rule China until the early 20th century. Qing does not exist at the beginning of the grand campaign, but can be formed by the Manchu, which in turn can be formed by Jianzhou, Haixi, Yeren or any other country with Manchu primary culture. We have taken the Northern Capital and defeated the false emperors. The Middle Kingdom must be united under a Manchu banner. Our dynasty shall reign for a thousand years! owns Ningyuan (704), Xilin Gol (723), Shenyang (726) and Beijing (1816). does not have the modifier “Tribal Succession Crisis”. becomes a core province of the country. changes its culture to the primary culture of the country. changes its government rank to empire. gets a permanent claim on every province of China that it does not own. then it changes to Chinese technology group and unit type. then it becomes Confucian and harmonizes with Tengri. Qing shares many events with Manchu, Ming, and Jianzhou. mostly focused around historical economic and military reforms. Enlist disgruntled soldiers and officers from the Ming army and establish the Green Standard Army. has its ruler as general. has unlocked 5th Manchu national idea: ‘Green Standard Army’. is at war with Ming. has a stability of less than 0 or a warscore of less than -10.
gets 4 regiments of infantry and cavalry in Cicigar (725). gets the opinion modifier “Enlisted disgruntled Ming soldiers and officers to the Green Standard” towards the country for 20 years, worth −100 opinion with a yearly decay of 1. Establish a more centralized military force by establishing the Eight Banners. 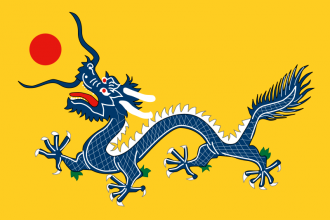 has unlocked 3th Manchu national idea: ‘The Eight Banners’. has a stability of at least 1.
gets 4 regiments of infantry and cavalry in its capital. Once formed, Qing has the same missions as Ming. Start as one of the Jurchen Tribes and form Qing. Become Chinese Emperor as Qing. This page was last edited on 24 April 2019, at 08:06.